Godiva quadricolor is a species of sea slug or nudibranch. 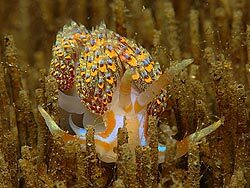 It preys on anemones, corals and on other nudibranchs. They can lay up to one million eggs. It is one of the few introduced marine species which has established in no other states apart from WA in the Fremantle and Cockburn Sound area. They are found on wharf pylons, crawling over the pylons around the mid-to-low tide level. Most likely it was introdiced by shipping, perhaps by adults attaching themselves to the hulls of ships or by larvae being transported in ballast water. The potential impact of this species in Australian waters is unknown. However, if any impacts are found, they are likely to be very small. No measures have been taken to control the species due to their relatively small numbers, minimal impact and restricted distribution. THey still need to be monitored however.